What is the origin of the Roycroft name? Elbert Hubbard gave various explanations at various times. Roycroft was the surname of a pair of English printers, whose work is to this day both respected and collected. Hubbard probably had heard of them on his earlier trip to England and wanted to give his new, independent press a name with an English medieval cachet. He later said he chose the word because it means "King's craft." In medieval times, the best work that a craftsman produced was given as a gift to the king. Hence, the phrase "fit for a King." By implication, Roycroft wares also were "fit for a King" and, as Hubbard hoped, had Mr. & Mrs. Middle America thinking they were deserving of such. What is the meaning of the circle and cross that are on many Roycroft items and the pages of this site? The mark is commonly referred to as the Roycroft orb or simply 'the Orb.' The basic shape, minus the inserted "R," is a medieval colophon with which monks ended their manuscripts in order to signify they had done the work to the best of their ability. Hubbard used the mark with an inserted "R" to signify Roycroft, as both a shop mark and as part of the general medieval craftsman ambiance he was trying to engender. It should also be pointed out the Italian papermaking firm, Cartiera Magnani, one of the most respected paper mills in Europe dating its origins back to the 15th century, used and uses today, a very similar 'orb' as their mark. Did Elbert first learn of and lift the symbol from Cartiera Magnani, then slightly modify it to avoid trademark infringement, since he probably would have been aware of Magnani due to his 'involvement' in the book arts? That answer is buried at the bottom of the Irish Sea. As to the supposed spiritual significance of the Orb, Elbert gave various explanations. (Some "authority" on Antiques Roadshow said it signified the hand of God over the world. Pick an explanantion...any explanation.) Interesting to note, Nabisco also used the same mark, but substituted an "N" for the Roycroft "R." (And does to this day, check any Oreos cookie.) A lawsuit resulted over the mark which ended with an out-of-court settlement in which Nabisco promised never to publish books and Roycroft promised never to make biscuits. Roycroft did, however, later make and sell Maple Pecan Patties. I have a signed Roycroft book. Does this make it valuable? Elbert was a very busy man. Not only was he writing the copy for three monthly magazines, but he lectured nationally, and managed the Roycroft business. As a result, staff was authorized to sign limited editions in his absence. Does this mean any "signed" Roycroft item doesn't really have Hubbard's signature? By no means. But, about the only signed items that you can be absolutely 100% certain of are his passport and personal checks. This isn't a real big deal however, because "signed" items are almost assuredly more valuable than non-signed ones. Another note, Elbert played pretty fast and loose with "limited" edition numberings. Not only have I seen edition numbers higher than the top end of an edition run, but also duplicate "limited edition" numbers of the same book. Once again the value isn't damaged significantly, in fact some collectors look for just these items. What is the value of a Roycroft item I own? Flat answer: It depends on the condition. Detailed answer: With the general interest level in the Arts & Crafts era and Roycroft in particular, items have jumped in value in the past few years. Does this mean your single, heavily worn volume of the relatively common 14-volume, 1927 edition Little Journeys set is a ticket to your child's college education? No way (not yet at least). In general, big furniture, very (real) limited edition books, and lighting are the most valuable. At the bottom of the Roycroft food chain, but by no means dirt cheap, are mass distribution books published after Elbert's death in 1915. (If you disagree with my assessment, please don't yell at me, ask any antiquarian book dealer.) If you really want to know a value, first consult a reputable dealer (not the first Joe you meet) or check Ebay to see what prices items are bringing. And remember, everything will be dependent upon the item's condition. I have seen copperware ruined by a well-meaning person who scrubbed "clean" the original finish, so it would look "nice" for a potential buyer. Are there recordings of Elbert's speeches? This is the Holy Grail of Roycroft collecting (followed closely by Roycroft pottery, and no, not the honey pots, maple syrup jugs or modern RR pieces). Sadly, there are no known recordings of Elbert's orations anywhere. If you find one, let the Fra know! That said, there are recording on a Roycroft(!) label. There was a brief Roycroft record label in production between the years 1927-1930, affiliated with the Cameo label. They were manufactured in New York City and distributed by Wise & Co. of EH's Scrapbook and Notebook fame. They were high production-value 78s, featuring mostly The English Singers doing sacred and secular English choral pieces, but also other artists, such as a chamber string ensemble accompanied by a cageful of canaries. They produced the only known recordings of the Cheerio radio program (although these were studio recordings and not direct radio transcripts). This was a morning program that was on New York stations and then NBC in the '20s and early '30s. Cheerio was much later revealed to be Cyrus K. Field. He reads some poems, and there are several singers as well. 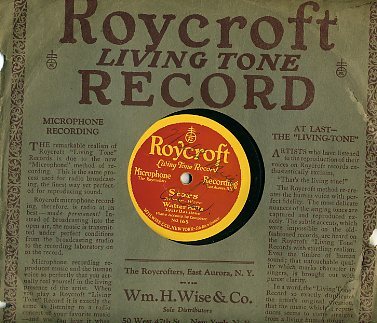 Roycroft records were produced in small numbers and are great rarities today. And here's a picture of one label from an eBay auction. A tip of the Sombrero to Peter Fraissinet, Royal Member of the Elect, for most of this info! Did Elbert Hubbard ever meet or deal with Frank Lloyd Wright? Great question and a fairly common one (by definition that it is listed here). Yes, he did; and as proof, we have the following quotation from John Lloyd Wright's biography of his father, "My Father Who Is On Earth." Elbert Hubbard was almost as picturesque as was Father -- they talked arts, crafts and philosophy by the hour. Said Elbert the Hubbard to the Papa one night, "Modesty being egotism turned wrong side out, let me say here that I am an orator, a great orator! I have health, gesture, imagination, voice, vocabulary, taste, ideas -- I acknowledge it myself. What I lack in shape I make up in nerve . . ." Said Dad the Papa to the Hubbard, "Not only do I intend to be the greatest architect who has yet lived, but the greatest who will ever live. Yes, I intend to be the greatest architect of all time, and I do hereunto affix 'the red square' and sign my name to this warning." Just a couple of boys trying to get along. But Dad's ego is naive. A Deep Curtsy to Fra Marcus for the quote and the Heads Up! What books are available so I can learn more about the Roycrofters? The best general reference work is Charles Hamilton's Roycroft Collectibles. An updated version is now available. It is a must-have for Roycroft collectors. Mr. Hamilton also wrote As Bees in Honey Drown, the story of Elbert and his second wife, Alice's, romance. It is now in its second edition, and well worth hunting down. For the specific interest of Roycroft metalwork, get Kevin McConnell's Roycroft Art Metal and RAM 2. They are very detailed and filled almost entirely with color photos. At many antique shows and on Ebay, metal work items will be referenced as being McConnell Number such-and-such, so you need the "scorecard" to know what's happening. For those who intend to get serious about book collecting, you will need a copy of A History and Bibliography of the Roycroft Printing Shop by Paul McKenna. The new revised edition is now available and production is limited to 500 copies. The first edition is out-of-print and next to impossible to find, so get moving. You should be able to order any of these from any major book store or directly from the publishers listed below. SPS Publications, PO Box 769, Tavares, FL 32778 It sells for $24.95. Schiffer Publishing, 77 Lower Valley Rd., Atglen, PA 19310 I don't know the price. Tona Graphics, PO Box 58, Grand Island, NY 14072 The new 2nd edition sells for $35 plus shipping. Are Roycroft items being made today? No, production ceased for all intents and purposes when bankruptcy was declared in 1938. However, in 1976, a group of Roycroft enthusiasts joined together to form the Roycrofters-at-Large Association. To avoid confusion, a new mark was devised, an "Orb" with a back-to-back "R" replacing the original single "R." This came to be known as the mark of the Roycroft Renaissance. Artisans who meet the exacting standards of RALA are designated Roycroft Renaissance Artisans and are allowed to display and mark their works with the double-R orb. Some of the work being done is of a better quality than the original stuff. Are there any museum exhibitions of Roycroft items? There was a small exhibition traveling the US titled "Roycroft Desktop." It is based on the Burchfield-Penney Art Center at Buffalo State College's Roycroft collection. The Mother of all Roycroft exhibitions has passed into history and it's contents sent back to the owners. If you missed this "Head, Heart and Hand" show, your only hope now is to get a hold of one of the show catalogs. It is a font of info and beautifully done in its own right. Why are you doing all this? The Fra-in-Charge sincerely believes with his whole heart in the admonition John Ruskin made over a century ago. They are words he lives by. We are not sent into this world to do anything into which we can not put our hearts. We have certain work to do for our bread and that is to be done strenuously; other work to do for our delight and that is to be done heartily; neither is to be done by halves or shifts, but with a will; and what is not worth this effort is not to be done at all. If you have a question which wasn't answered here, let The Fra know and he'll either e-mail you back directly or post the answer here. To return to the Main Webpage of the Roycrofters.